Customisable to your exact requirements. Hundreds of users since 1992! Estimates are Costing you Money! How many do you do to get even One Job? For House Bulders – “FastBuild” (c) provides a customisable integrated house sales, financial & project accounting software for house builders and property developers of all shapes and sizes, whether you are building large volumes of properties or one off developments we have a solution for you. In use by 100’s of builders, since 1985! For Specialist Contractors – We also have many solutions for commercial construction, tilt panels, civil engineering, steel fabrication, kitchen & bathroom renovators, shopfitters, cabinet makers, pest controllers, plumbers, electricians, and more. For Service and Maintenance – Fast Track Computer Solutions provides software for service and maintenance, defects management and snagging, offered as a stand-alone solution or as part of an integrated finance system. Whether you are a maintenance/insurance provider undertaking planned and reactive maintenance tasks, or a contractor/house builder undertaking post build defects management or snagging we have a solution for you. Are you looking for an Estimating/Quoting Solution? Do you want a Customised App for your Industry and Company’s Requirements? Would you like to save time and increase your accuracy with your Tenders? Since 1985, we have assisted 100’s of businesses like yours to spend less time and generate more Sales. Our team has more than 70 years construction and engineering industry experience which means you are working with an experienced team who can show you how to achieve your goals using FastBuild Building Estimating Software. Our FastBuild Building Estimation Modules allow you to rapidly produce accurate, cost-effective and perfectly customised building and construction estimates for your clients. 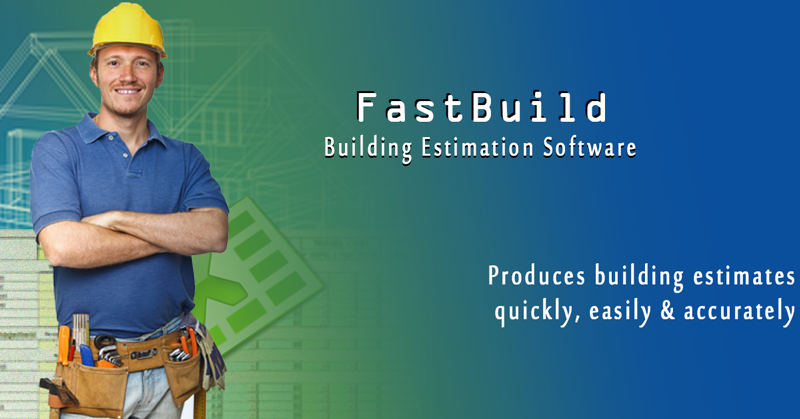 Simply stated, by allowing you to produce more quotes in less time, the FastBuild Building Estimating Software brings in more work than manual estimation methods. Are you tearing your hair out after spending a long day on site? Then coming home and spending even more hours on paperwork, compliance, bills, estimating, etc! Fast Track your business success with smart software solutions Time is the nuts and bolts of any construction enterprise. But paperwork can force you to take valuable time off the tools. It can also lead to staff downtime and costly errors. That means lost productivity which equals lost profits. Fast Track Computer Solutions helps you trade pen-pushing for greater paperwork performance in a fraction of the time. This frees you to put your focus where it should be — on your business! We have over 47 years of experience in applied business, industry and project management software, so we know exactly what you need from your Build Estimating Software and how you can get it. When looking at the Estimate window you get to see a mini version BoQ & Client Specification at the same time so you can view and analyse the hard copy drawing all at the same time (2 screen monitor set-up & ‘paper’ plans). Want to get ahead of the competition with prime productivity? More secure and stable record keeping. To book your free consultation, call us today on 08 9275 9188. 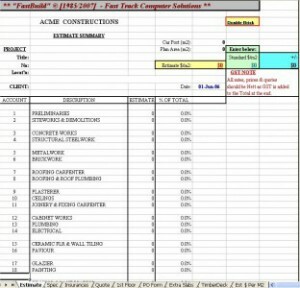 © “FastBuild” Building Estimating Software serving 100’s of Builders since 1985! Got MS Office but struggling to use it? Over the last 30 years we’ve helped thousands of business owners learn how to use their software to save time and save money. We have flexible and tailored MS Office, one-on-one or your own small group training. We cover Word, Excel, Outlook, Access, Project, and Primavera. Our highly popular Estimating Systems will Save you an Unbelievable amount of Time! Call us to see why our Easy-to-Use Estimating System is the most popular in our State. Hundreds in use since 1985! The only training needed is when we demonstrate the package to you. These Software Solutions have been developed by Ivor Kosowitz. He is a Registered Builder, Member of the Australian Institute of Building, Planning & Cost Control Engineer, and an Accredited Trainer with over 47 years International and WA experience in the Construction Industry. Projects have included Residential, Commercial, Industrial and Infrastructure. Where applicable, we can interface your Accounting System with “FastBuild”. Fast Track is a member the Master Builders Association (MBA), for over 20 years. All modules are configurable to National and World Wide-International Specifications. “FastBuild – FastJobs – FastSteel“ FastBuild is a suite of software modules which has been in development for all aspects of the construction and building industry since 1985. Hundreds of workers in this industry have benefited from software solutions which are very unique. All our modules have been developed using Microsoft Office Professional. Specialised consulting, programming, support and training services are also available. As a result we can CUSTOMISE a solution to your unique business requirements. Contact us to find out more. 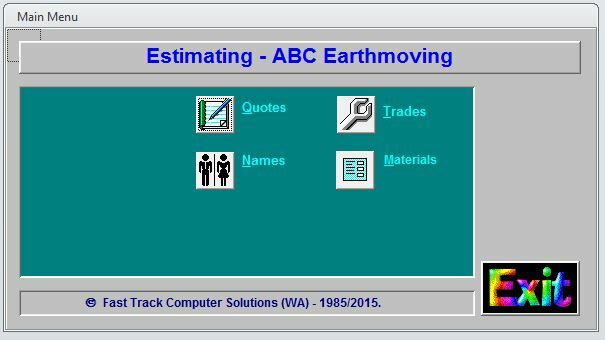 Estimating Software Various Solutions for Domestic (Double Brick and Framed) and Commercial buildings, Jobbing Works, Steel Fabrication, Brickwork and Masonry, Concreters including Tilt-Up Panels), Plastering, Plumbing, Electrical, Painting, Earthmoving, Joinery etc. Our most popular system for Residential Builders has an “Auto Take-Off” feature. Almost you have to do is to enter the overall width and length, the internal walls, and the window and door openings. Most of the quantities are measured automatically. Hundreds of builders have been using this system since 1984! 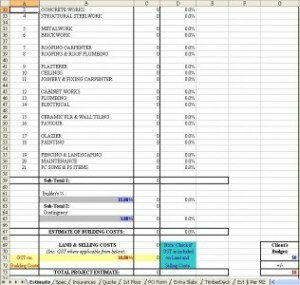 Project Cost Control and Reporting (Specially designed for Project Managers and Architects). Project Information Database Records all historical data on projects eg: Timing, Costs, Man hours, Profitability Resources Used, Estimated vs Actual, Status, Prospects etc. Many reports and additional can be generated. Useful to assist in fine-tuning Rates for Estimating. Builders Administration (Special Front-End version also available which can be integrated with the MYOB or Quickbooks Accounting packages). This system will assist you to conform with the Construction Contracts Act 2004 (WA). Specialised Sub-Contractors Administration (Used by Plumbers, Concreters, Bricklayers, Glaziers, Steel Fabricators, Scaffold and Plant Hire, Painters, Ceiling Fixers, Cabinet Shops, Earth Movers, Drainage Contractors etc). Maintenance and Jobbing Works Scheduling and Administration (In use by Plumbers, Building/Insurance Maintenance companies, Ship Builders, Mining Companies, etc, Pest Contollers, Etc). Sales Administration (Tracks Clients and Prospects, and any other historical and/or future work or contacts associated with them). Document/Drawing Control (Tracks Source and Recipients, Revision numbers, Generates Transmittal Notes etc). **Note: “FastBuild” MYOB or Quickbooks Interfacing has not been endorsed and is not supported by MYOB Australia, or Quickbooks Australia. Fast Track Computer Solutions is a Network Member in the Microsoft Partner Network. Premier Displays are a shopfitting company established in 1978. We are based in Sydney NSW servicing Australia wide. I was introduced to Ivor and Fast-track approx. 2 years ago. I wanted to implement an Estimating Software Package that could evolve with my business. I was happy with what I saw however the distance between WA and NSW was a concern. I’m pleased to say I am 100% happy with the software and service. As a result I’ve since made several changes to streamline the process further along with adding a maintenance component. I have no hesitation recommending Ivor and Fast-track. The results have been excellent.